We’ve been cooking sporadically these days and by sporadically we mean you-will-not-believe-how-much-we-have-eaten-out! Like seriously, we have been all Operation Do Worse instead of Operation Do Better. While it’s not impacting our budget so much, we have some concerns that it might be impacting our health. So at first opportunity we got in the kitchen and made some kitchen alchemy as Reese likes to call it. We’ve been kind of stumped for ideas, but have vowed to stay out of the grocery store and eat what we have on hand when we cook. There has been a butternut squash sitting in our kitchen and silently mocking us (what your vegetables don’t mock you?) each time we grabbed something out out of the bowl where we keep our vegetables. Did we want soup? A casserole? Roasted? What, oh what, to do with the butternut! Turns out we didn’t want to do any of those things. Instead we decided on curry and boy were we glad we did. 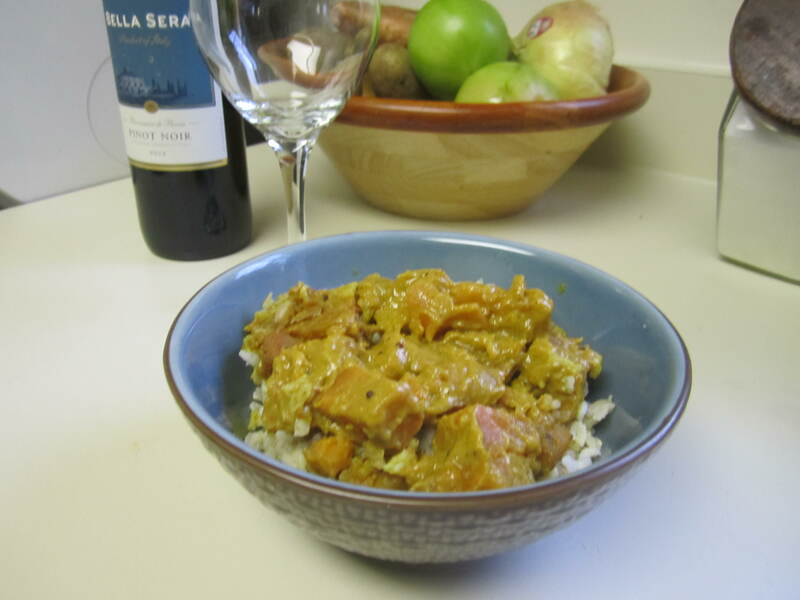 I found a fairly simple recipe for butternut squash and sweet potato curry. Ding, ding! We have a winner. We love Indian food and we make and eat Chana masala and even get our Tandoori on from time to time. The spicy curry powder in this dish was a nice foil to the sweetness of the butternut squash, sweet potatoes and sweet onions we used in the dish. Sauté the mustard seeds, but be careful they start to pop when they get hot. To avoid popping I tried to keep the heat at a medium flame and essentially put the chopped union in half a second after stirring the seeds just enough to get them coated with oil. Once your onions become a bit translucent, add in a teaspoon of curry powder. I only used a teaspoon to begin because Reese said the particular curry powder I chose to use was rather spicy. Coat the onions in the curry powder. Your house should smell amazing at this point. 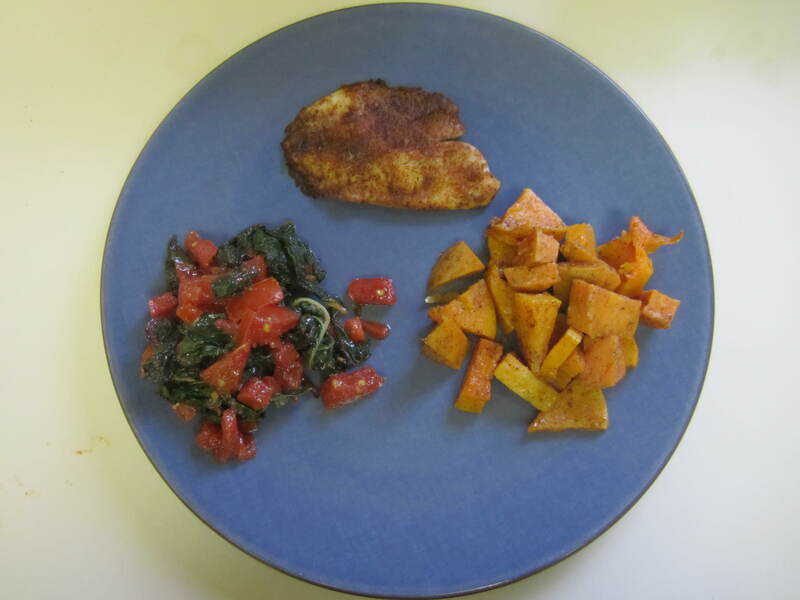 Then dump in your chopped butternut squash and sweet potatoes. I sautéd the butternut squash and sweet potatoes much the same way I do when I make home fries, allowing the sugars from the veggies to carmelize and covering it with a lid to allow the steam to sweat the veggies at the same time. At this point, I also sprinkled some sea salt over the mixture. To help the veggies cook down enough to get tender, I added a little organic veggie broth. Don’t overcook your veggies, or it will be mushy. I threw in a handful of curry powder that had much less spice and then another teaspoon of the spicy curry. If you like spice, but not this much, skip this step. I added a half can of coconut milk, stirred to incorporate, allowed it all another few seconds to heat through and Violá! Butternut squash and sweet potato curry. Serve with some brown basmati, or jasmine rice and red wine. Warning: Objects should be bigger than they appear. We do not advocate these portion sizes. It’s that time of the year when Mother Nature’s bounty runneth over, and that was the case with the fairly good sized butternut squash and gigantic sweet potatoes that started this whole thing. When I chopped up both the squash and the potatoes, I was overwhelmed with how much we had. Reese suggested that we curry half and roast the rest. She whipped out some traditional spices like cinnamon, nutmeg, cumin and olive oil. She tossed the veggies in the oil and then got her sprinkle fairy on and popped them in the oven until they were fork tender. Serve this as a side dish to baked fish, sautéd swiss chard and our crockpot black beans (not pictured) and you have an easy and colorful dinner. We hope you find your way back to the kitchen and we hope it’s delicious. Happy feasting! Categories: Cooking, DIY, Recipes, Uncategorized | Tags: baked fish, black beans, butternut squash, cooking series, curry, foodie, Indian cuisine, operation do better, sweet onions, sweet potatoes | Permalink. I tried butternut squash before and it was TOOOOOO BIG. It is good though. You definitely get a lot of bang for your buck when you buy a butternut squash, so you must have plans for how many ways you can eat it. Beautiful thing is you can cook half and freeze the other half. I find the toughest thing about butternut squash is cutting it. Sharp knives are a must.